-The Heat needed this win tonight. No matter who was dressed in a Nets uniform tonight. -These are the games they have to win. -Tyler Johnson led the way early with 18 first half points. Now with back to back 20 point games, he's looking more like the sixth man he was last season. 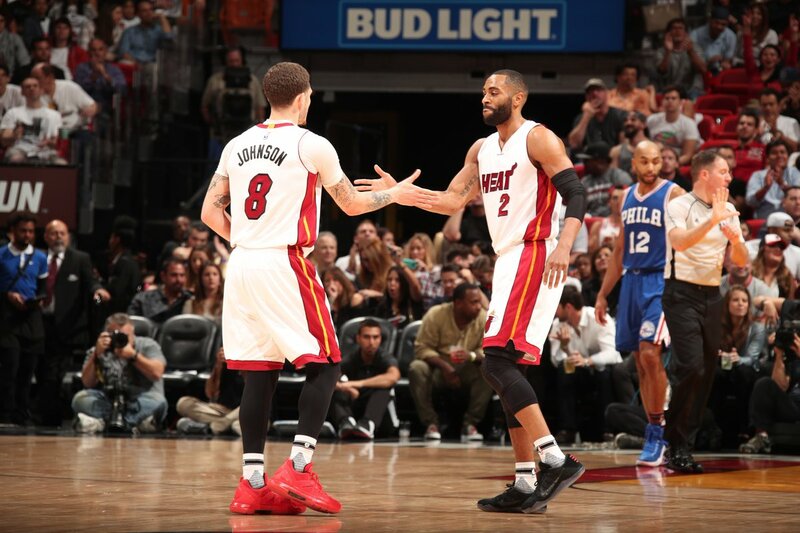 -Goran Dragic and James Johnson picked it up in the second half. -Another Ellington dunk! His second of the season. -Heat did a great job protecting the ball tonight with a season-low 5 turnovers. That's the third time this season the Heat had fewer than 10 turnovers. -Justise Winslow shot 4/4 from three pointer tonight. He's not going to shoot like that every night. However, if he can shoot a decent percentage from there, it'll force the defenders to guard him. -Waiters didn't shoot the ball well tonight going 1-10 from the field. -Up and down games remains the issue so far for him. Just like it has been for others on the team. -Former Heat All-Star forward and two-time NBA champion Chris Bosh watched the game from the sidelines tonight with his wife, Adrienne Bosh. Alonzo Mourning and Glen Rice were also in attendance.